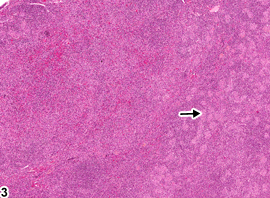 Lymph node - Inflammation, Suppurative in a male F344/N rat from a chronic study. Lymph node is focally expanded by a suppurative exudate. 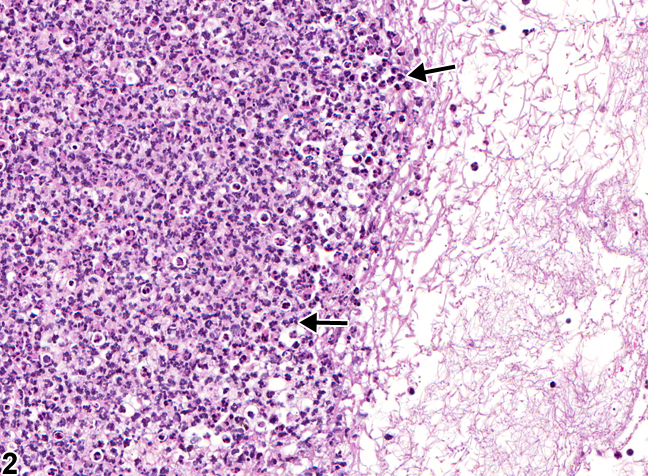 Lymph node - Inflammation, Suppurative in a male F344/N rat from a chronic study (higher magnification of Figure 1). The suppurative exudate consists of degenerate neutrophils (arrows), cell debris, proteinaceous fluid, and fibrin. 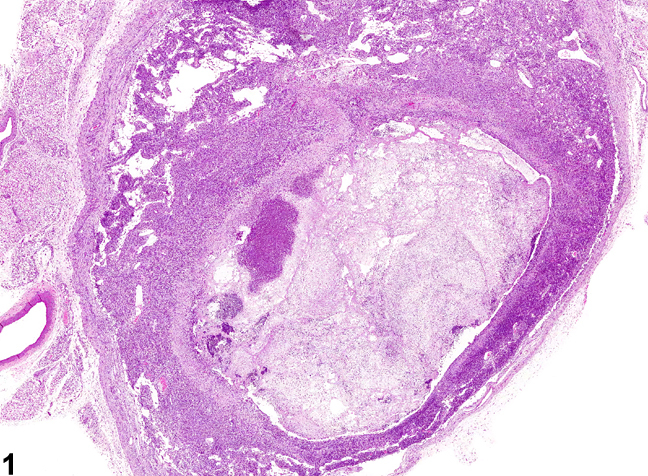 Lymph node - Inflammation, Granulomatous in a female F344/N rat from a chronic study. 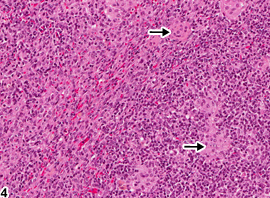 The lymph node is infiltrated by sheets and aggregates of large, activated macrophages (arrow). 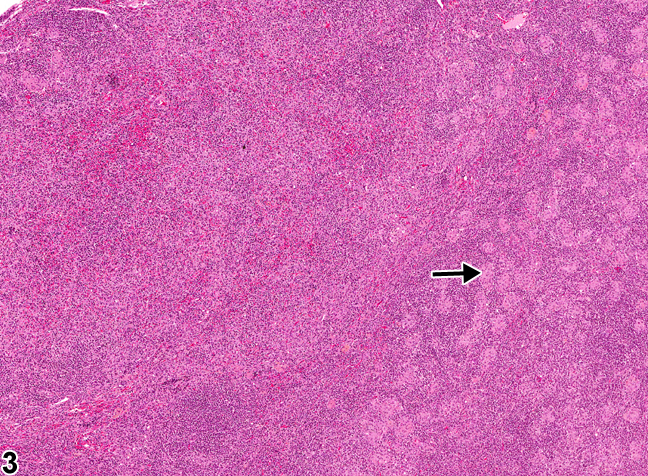 Lymph node - Inflammation, Granulomatous in a female F344/N rat from a chronic study (higher magnification of Figure 3). 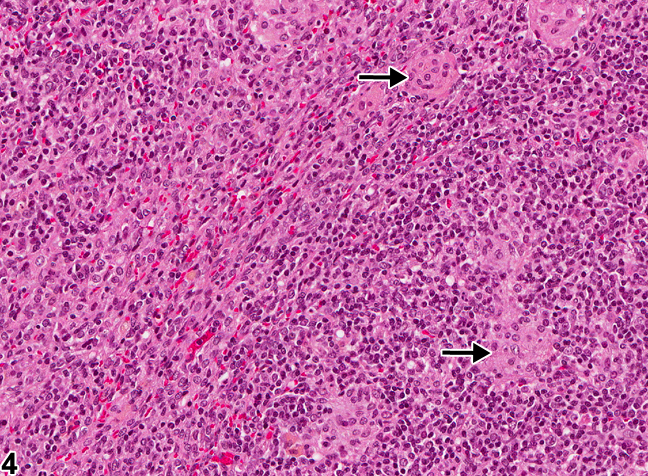 Multiple aggregates of macrophages (arrows) are admixed with mature lymphocytes. Inflammatory cells can be found in lymph nodes as a result of administration of an irritating test compound, in response to primary lymphocyte necrosis, or as a response to an infectious agent or foreign body. Inflammatory cells can also be found in lymph nodes draining sites of inflammation, in which case the primary lesion should be diagnosed and "infiltration, cellular" should be diagnosed in the associated (draining) lymph node. In NTP studies, the five standard categories of inflammation are acute, suppurative, chronic, chronic active, and granulomatous. In acute inflammation, the neutrophil is the predominant infiltrating cell, though fewer macrophages and lymphocytes may also be present. Edema or hyperemia may be evident. The neutrophil is also the predominant cell type in suppurative inflammation, but the neutrophils are aggregated, and many of them are degenerate (suppurative exudate) ( Figure 1 and Figure 2 ). Cell debris from both the resident cell populations and infiltrating leukocytes; proteinaceous fluid containing fibrin, fewer macrophages, occasional lymphocytes, or plasma cells; and, possibly, an infectious agent may also be present within the exudate. Grossly, these lesions would be characterized by the presence of exudate. In the tissue surrounding the exudate, there may be fibroblasts, fibrous connective tissue, and mixed inflammatory cells, depending on the chronicity of the lesion. Lymphocytes predominate in chronic inflammation. Lymphocytes also predominate in chronic active inflammation, but there may also be a significant number of neutrophils. Chronic and chronic active inflammation may contain macrophages. 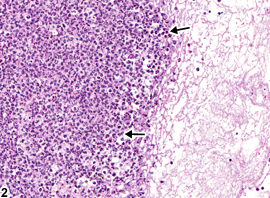 Granulomatous inflammation is another form of chronic inflammation, but this diagnosis requires the presence of a significant number of aggregated, large, activated macrophages ( Figure 3 and Figure 4 ), epithelioid macrophages, and/ or multinucleated giant cells. Macrophages may contain cytoplasmic hemosiderin or lipofuscin pigment or poorly degradable substances. Lymphoid hyperplasia or atrophy and plasma cell hyperplasia may occur in association with nodal inflammation. When present, lymph node inflammation should be diagnosed and graded. The terms "pus" and "abscess" should be used as gross diagnoses only. "Chronic active" can be used to describe lesions with components of both acute and chronic inflammation. Inflammatory cells found in lymph nodes draining sites of inflammation and necrosis should be diagnosed as "infiltration, cellular" and distinguished from primary inflammation of the lymph node. Associated lesions, such as necrosis or hemorrhage, should not be diagnosed separately unless warranted by severity, but should be described in the pathology narrative. Elmore SA. 2006. Enhanced histopathology of the lymph nodes. Toxicol Pathol 34:634-647. Elmore SA. 2006. Histopathology of the lymph nodes. Toxicol Pathol 34:425-454. Frith CH, Ward JM, Chandra M, Losco PE. 2000. Non-proliferative lesions of the hematopoietic system in rats. In: Guides for Toxicologic Pathology.TP/ARP/AFIP, Washington, DC. National Toxicology Program. 2007. NTP TR-535. Toxicology and Carcinogenesis Studies of 4-Methylimidazole (CAS No. 822-36-6) in F344/N Rats and B6C3F1 Mice (Feed Studies). NTP, Research Triangle Park, NC. National Toxicology Program. 2011. NTP TR-565. Toxicology and Carcinogenesis Studies of Milk Thistle Extract (CAS No. 84604-20-6) in F344/N Rats and B6C3F1 Mice. NTP, Research Triangle Park, NC.